We love providing Clearwater Mold Testing services to our clients! Even small amounts of mold inside or outside your Clearwater home may cause serious health issues, from allergies to life-threatening conditions like pneumonia. A property infested with mold is unfit for living, nor can it be sold – and remains a burden both for the home owner and for the real estate agent. Airborne mold, not visible to the naked eye, is the main concern, often caused by poor clean-ups that disturb it and spread it throughout the building. Without airborne mold testing, mold assessment cannot be complete. Don’t let poor testing and incompetent mold removal cost your family their health, because undetected fungi continue having their dangerous effect. With over 20 years of experience inspecting buildings for mold and indoor air quality (IAQ) in Clearwater, Expert Mold Test has the expertise in detecting and locating mold, including airborne mold, as well as testing and assessing IAQ. Over the years, we have inspected thousands of homes, offices, apartments, schools, and medical facilities in the Greater Tampa Bay area (Tri-County), and detected the problems even in the buildings where no visible mold was present. eliminating odors (caused by smoke, pets, spills, foods, decay) to improve IAQ. Please note that Expert Mold Test does not perform remediation/clean-up of mold contamination. It is our policy to have no financial interest in the discovery of mold or the results of any remediation. We inspect the inside and outside of the premises to locate mold issues and indicate which rooms need to be air sampled along with an outdoor control sample. The building will be inspected top to bottom, including the attic, crawlspaces, interior spaces for potential moisture problems, exterior for gutter, downspout, windows, grading and foundation problems. 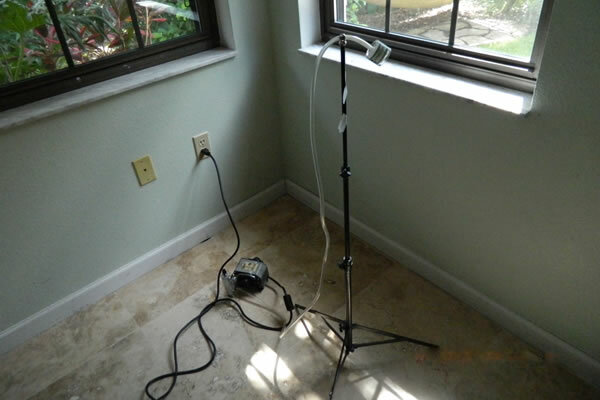 The service includes moisture meter surveys to detect the areas of your property, where elevated moisture content is or can be causing mold issues. We take a minimum of 3 air samples (2 inside & 1 outside for comparison), with additional samples as needed for over 1000 sq ft or as requested by the client. To analyze the surface area, suspected to be infested with mold, we take a swab or a physical sample. The sampling will determine if mold contamination is localized or spread throughout the building. The samples are tested at our preferred lab, one of the leading providers of environmental laboratory testing services in the world, with experience in mold testing and bio-aerosol analysis. Neither Expert Mold Test nor the laboratory pursue any interest in detecting mold, so you can be confident in the 100% objectiveness of the results. Mold test results can be provided within only 2-3 days after testing, and the report will contain the mold types and levels found. All lab results are documented and are legal documents with individual identification numbers, so you can use them as a legal proof, should it be necessary. After all moldy surfaces are cleaned or removed, we provide final air assessment services. Air samples of the affected rooms will show mold levels have decreased to an acceptable level in these rooms. This ensures your confidence in the effectiveness of the mold clean-up. the lab we use is accredited by the American Industrial Hygiene Association (AIHA), EMLAP Accredited, and participates in the AIHA EMPAT Program (Environmental Microbiology Proficiency Analytical Testing). If you think your house may be contaminated and threaten your health, or are stuck with a property sale because of odors or mold, call us at 727-321-9296 or send a message, and we will deliver a professional service at our best price.